Parinirvana means "death of an enlightened being." April 4th marks the parinirvana of Chögyam Trungpa Rinpoche. Please join us for any or all of the day's events. Kindly preregister here for the Sadhana of Mahamudra Feast so we can plan with the appropriate amount of food. We will also celebrate with an Avalokiteshvara Feast on Saturday, April 6th, with a lung offered on April 2nd. Learn more and register here. 10am Acharya Dale Asrael will present the lung for "Bestowing Supreme Blessings: The Guru Yoga of Trungpa Rinpoche Dharma Sagara" by HH Dilgo Khyentse Rinpoche (1988). This lung is restricted to tantrikas who have received pointing out transmission in the Shambhala lineage. 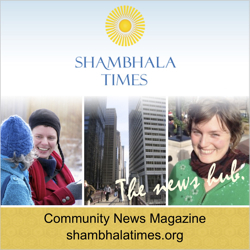 6–9pm Sadhana of Mahamudra Feast—open to the public!